Tap this page for Electronic Certification Accreditation Council Jobs 2019 ECAC Pakistan | nts.org.pk. Electronic Certification Accreditation Council (ECAC), requires the services of experienced professionals against the following posts based at Islamabad and the list of positions is given below. Jobs in ECAC Pakistan are (Registrar, Secretary, Director Repository, Director Accreditation, Researchers, IT Security Auditors, Finance & Admin Officer, Computer / Office Assistants). Appointment of these positions will be done on a contract basis as per the policy of ECAC Pakistan and it can be extendable on satisfactory performance of an individual. Candidates from all over Pakistan are welcome to apply because positions are on open merit basis so eligible candidates from any province are welcome to apply. ECAC stands for Electronic Certification Accreditation Council which is a regulatory body having enforcement powers to regulate electronic transactions in public and private sectors under the Government of Pakistan. 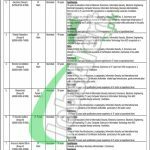 As Electronic Certification Accreditation Council is Government body so jobs announced under it are Federal Government jobs and latest ECAC Pakistan Jobs 2019 are announced today which can be examined from this page given below. Candidates wanted to apply for these jobs are suggested to compare themselves with eligibility criteria mentioned in the following image posted below and if generally talk about the required qualification and experience then we found that Masters qualification in relevant discipline is required for Sr. No. 1 to 6 and for Sr. No. 7 Graduation in Business Administration/Commerce is required and for Sr. No. 8 Intermediate pass can apply. After final selection, the selected candidates will be offered handsome salary package by the ECAC Pakistan starting from Rs. 16,000/ to Rs. 85,000/ per month with other allowances such as House Rent, Conveyance Allowance, Medical Allowance & Utility Allowance will be admissible as per rules. Now, interested candidates wanted to apply are suggested to apply as per the following how to apply the procedure of NTS. Duly filled application form along with a paid deposit slip of test fee and a copy of CNIC and two recent passport size photographs to the NTS Headquarter Islamabad.